UH wide reciever Davone Bess was on the receiving end of 14 of Colt Brennan's 35 completions in yesterday's loss to Fresno State at Aloha Stadium yesterday. Moments after Hawaii receiver Davone Bess had the wind knocked out of him, he turned in one of the most breathtaking plays of his young career. 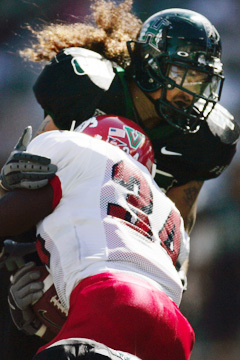 With the Warriors trailing Fresno State 20-13 with less than 6 minutes left in yesterday's Western Athletic Conference game, Bess ran his route to the right side of the field and UH quarterback Colt Brennan lofted a pass that appeared would sail well over Bess' head. But the freshman slotback stretched out and snagged the ball by stopping it with one hand. The ball then went to his other hand and he pulled it in for a 17-yard gain. To those watching in the stands, the catch was a highlight of a spectacular day for the UH receiver. To Bess, it was nothing special. "I just went up and got the ball," Bess said. "I saw the ball and my natural reaction was just to go up and get it." In the end, the effort went ultimately unrewarded as the Warriors' drive for the tying score stalled at the Bulldogs' 6-yard line and Fresno State added a late score for a 27-13 win. But Bess' performance drew praise from his teammates and coaches. "He's unbelievable," Brennan said. "He's just such a great football player. He goes out there and he has fun in practice and he makes those catches all the time in practice." "He's a very spectacular player," UH coach June Jones said. "I've been on record saying that I think he may be the best we've ever had and I'm glad he did it on national TV today, because he's pretty special." Bess tied a UH record with 14 receptions and led the Warriors with 158 yards, breaking the century mark for the third straight game. 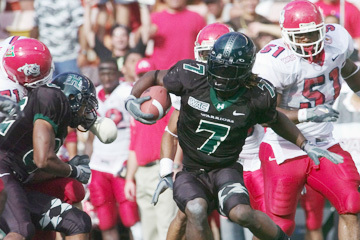 He also scored Hawaii's only touchdown, grabbing a 15-yard pass from Brennan in the second quarter. 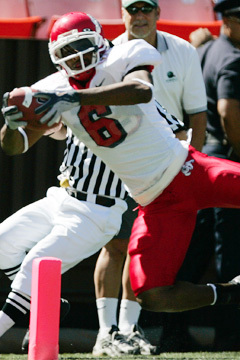 His reception total tied the mark set by Chad Owens against Army in 2003. 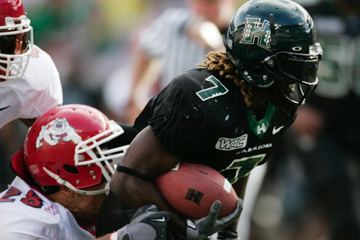 Hawaii's Davone Bess was pulled down by Fresno State's Emanuel Sanchez in the fourth quarter yesterday. Even before he arrived at Aloha Stadium, Bess said he felt he might be due for a big day. "Coach had us fired up the whole week in practice," he said. "Probably it was my best week of practice. I felt I was physically and mentally prepared." Bess' catch to start UH's drive with 5:38 left in the game was actually his second one-handed grab of the game. He pulled in another throw in similar fashion in the first quarter. "Sometimes he misses one (in practice) and we'll say, 'use two hands,' " Brennan said. "But then you get into game situations and he's only got one hand to use and he pulls out two unbelievable catches. It just shows the football player and athlete he is. All my guys, they've just got great hands and I love throwing them the ball." Bess was forced to leave the game briefly in the fourth quarter when he took a shot that left him breathless. But he made it back on the field for UH's next possession. "I got blindsided," he said. "I was looking at Colt waiting for the ball, and (the defender) just smacked me. I had an instant head rush. But it was all right, nothing major." Freshman Aaron Bain replaced him and caught a 17-yard pass on third and 14 to keep a drive alive. That possession ended with UH's only punt of the game and the Warriors got the ball back with 5:38 left. But they couldn't break through and left the stadium in frustration. "It's devastating getting that close," Bess said. "I knew coming into the game, this game was going to be real huge. Coach emphasized that this game is big, the Hawaii-Fresno State rivalry is real big. We just came up short. ... It's hard but we can't let it get to us." 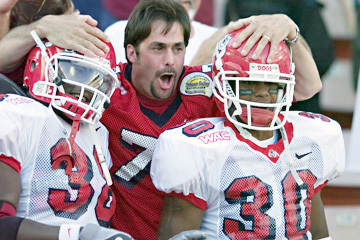 A Fresno State fan celebrated with players after the Bulldogs defeated Hawaii yesterday at Aloha Stadium. 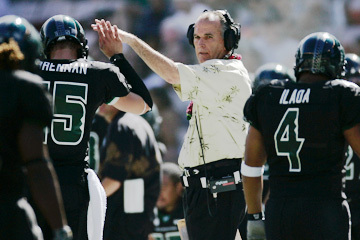 Hawaii coach June Jones high-fived Colt Brennan during the second quarter of yesterday's loss to the 22nd-ranked Bulldogs. 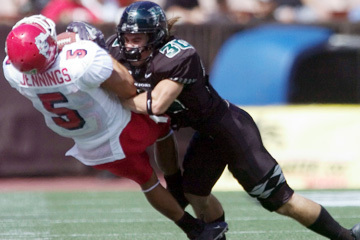 Hawaii's Dane Porlas put a big hit on Fresno State's Adam Jennings during yesterday's game. Porlas finished with a team-high six tackles -- four solo and two assists. Hawaii quarterback Colt Brennan reacted after throwing an interception during the fourth quarter of yesterday's game. Fresno State's Jermaine Jamison pulled in a 58-yard touchdown pass from Paul Pinegar early in the second quarter for the game's first score yesterday. Jamison finished with three catches for 78 yards. Hawaii's Tanuvasa Moe brought down Fresno State running back Bryson Sumlin for one of his four tackles yesterday (two solo and two assists).